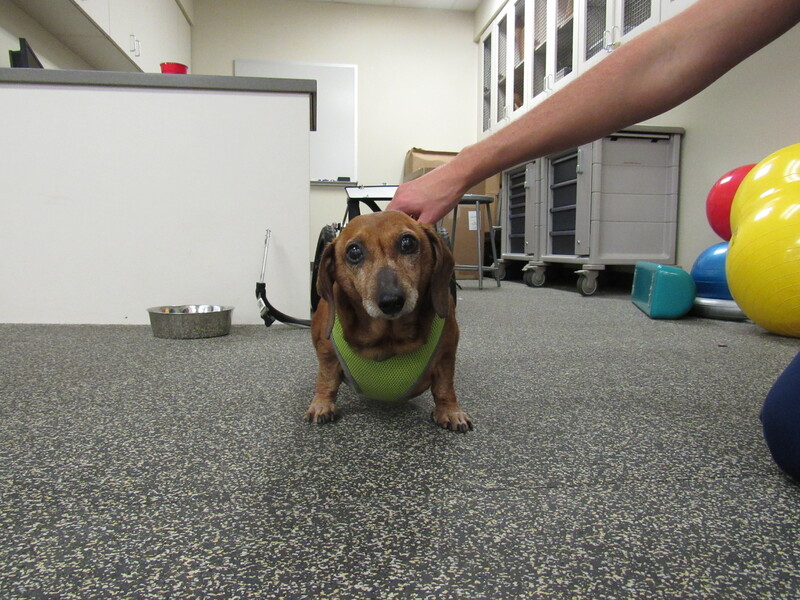 Hope is an 8-year-old, overweight dachshund who was rescued from a shelter and placed into foster care last summer. Her odds for living a healthy and happy life in a forever home were unfavorable, but a program in the College of Veterinary Medicine is helping dogs like Hope to have — hope — for just such a life. Hope weighed 38.5 pounds when she arrived at the Physical Rehabilitation Service in July. Teaching Hospital. Club Chub helps dogs to shed extra pounds safely while following a program of proper nutrition and exercise over a calculated and prescribed period of time. 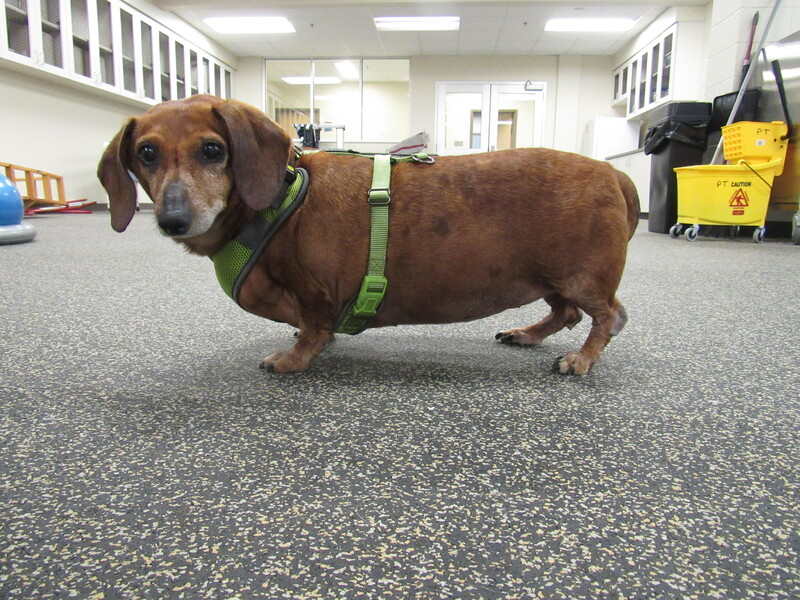 “Hope weighed 38.5 pounds when she was rescued from the shelter by GetALong Dachshund Rescue in July,” said Liz Hodson, a Licensed Veterinary Technician and Certified Canine Rehabilitation Practitioner who has personally supervised Hope’s progress in Club Chub. GetALong Dachshund Rescue is an organization that specializes in the shelter rescue of older dachshunds and those with severe medical needs. Hodson is adamant about balancing proper nutrition for all dogs — not just overweight animals. But overweight dogs may have more complex needs. Hope was examined and evaluated for underlying medical issues and her rehabilitation and weight loss program was specifically designed for her needs and unique circumstances. By following a program of prescribed diet and walking, Hope has dropped her weight over a five-month period to 23.4 pounds, according to Hodson. Hope has lost about 15 pounds in the Club Chub program in five months. Ground poles are sticks placed directly on the floor that require the dog to step over them as it walks, Hodson explains. “The dog exerts more energy by going over the ground poles than just ordinary walking, but we do not want an overweight dog jumping,” she said. Most of the animal patients that go through the Physical Rehabilitation Service have neurological or orthopedic conditions, Hodson says. However, others just need help losing weight, like Hope. About a year ago, Club Chub was started to address the specific needs of overweight dogs. “Our goal is to get Hope healthy, rehabbed and ready for adoption into a forever home,” Hodson said. Get Along Dachshund Rescue sponsors Hope’s participation in Club Chub through donations; however, Hodson says Club Chub is available for all pet owners whose pets have weight problems. More information about Club Chub can be obtained by contacting Hodson at the AUCVM Small Animal Teaching Hospital at (334) 844-4690. Learn more about GetALong Dachshund Rescue.